My morning Instagram feed, filled with friends (and close relatives, including my twin sis, below) holidaying in Tulum, Morocco, and other near-the-equator hot spots, first inspired serious vacation envy, then a serious swimwear shopping spree. 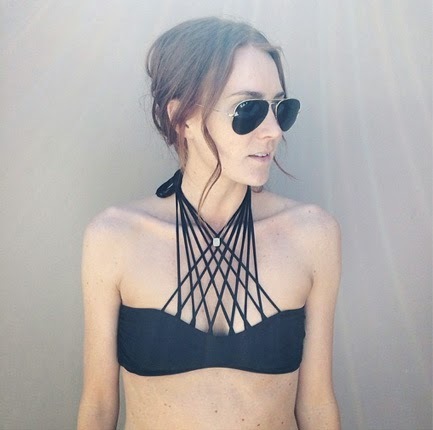 I kicked things off with the Mikoh criss-cross halter bandeau, pictured above (never mind the tan lines, it's the ultimate statement bikini top), knowing I could pair it with a simple black bikini bottom, like this one by J.Crew. (P.S. I also love this dramatic Victoria's Secret halter top--also statement-y, less expensive. Clearly, this look is going to be a thing this summer!) Then I snapped up these cute studded Forever 21 sandals, and finished off with this gorgeous lace cover-up. I'd love to go for this Lisa Mira Fernandez ruffled bikini too but feel like I actually need a tropical vacation plan to warrant it! what is that dress your sister is wearing? I want one! I second that! Who makes that dress?? agree who makes this dress!? The dress is by Necessary Objects from last summer. I picked it up in NY for $39! Sadly, it's no longer for sale but you can see it again here.